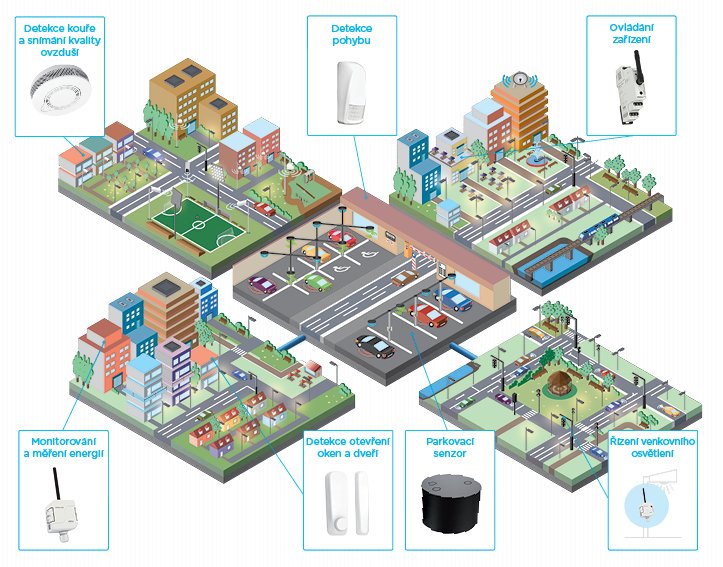 iNELS Air was developed in response to the dynamically developing network for IoT (Internet of Things). The IOT wireless communications category includes the Low Power Wide Area (LPWA). This technology is designed to provide full-range coverage inside buildings, energy-saving and low-cost operation of individual devices. The product group includes sensors for communication on the Sigfox, LoRa and NB-IoT protocol. Sensors connection with the ELKO Cloud and also IFTTT (If This Then That) making them suitable for a wide range of applications. Individual products have the letter "S", "L" or "Nb" in their type designation. This distinguishes the way of communication. "S" stands for communication over the Sigfox network, "L" stands for communication over the LoRa network, and "Nb" uses communication via the NarrowBand network. The network supports two-way communication with a limited number of feedbacks. It uses the free frequency band of 868 MHz. It has more extensive coverage across the Czech Republic and abroad and is therefore more suitable for long distance monitoring of the equipment. You can find current network coverage on the site www.sigfox.com. A two-way network that uses the free 868 MHz band for its communications. The advantage of this network is the possibility of freely deploying the individual broadcasting stations even in local locations, thus strengthening their signal. That is why it is effectively used in the field of companies or for example in cities. You can find current network coverage on the site www.lora-alliance.org. The network provides two-way communication, and the only licensed band that uses LTE or LTE-M. The advantage of NB-IoT is the use of already built grids, which ensures adequate coverage both inside and outside buildings. It uses this technology on its SIM card devices. You can find the current network coverage on the site www.vodafone.cz. he use of web-based networks ensures low energy consumption. Thanks to this, most of the sensors can be battery-powered and their capacity can last for an average of 2-5 years of operation. The sensors are simple and affordable. The price for ongoing communication varies depending on the type of network you choose - but in general this communication is considered affordable. All sensor data is encrypted before sending, ensuring its security. You can then access the individual measured data in the application or the ELKO Cloud under your personal login. This ensures the continuous supervision of your property. The design of the individual products is tailored to its purpose - the detectors are designed for placing in the interior of buildings, the modular devices in cabinets and, on the other hand, the products for outdoor use are IP65 rated. The wireless design of individual devices also allows for easy installation and almost immediate use.